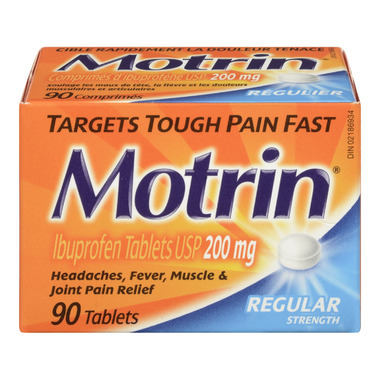 MOTRIN® 200 mg Tablets, Super Strength provide fast, effective relief of mild to moderate pain. MOTRIN® 200 mg Tablets, Regular Strength provides relief of mild to moderate pain in adults and children over 12 years of age. Each tablet contains 200 milligrams of ibuprofen to treat pain caused by headache/migraine; menstrual cramps; cold and flu; sprains and strains; joint and back ache; toothache; and muscle inflammation. The tablets are easy to swallow. Directions: Adults and children over 12 years of age: 1 to 2 tablets every 4 to 6 hours as needed to a maximum daily dose of 6 tablets. Should not be taken for pain for more than five days or for fever for more than three days without first talking to a doctor or dentist. READ LEAFLET FOR IMPORTANT INFORMATION BEFORE USE. Medicinal Ingredients: Ibuprofen, 200 mg.
Non-Medicinal Ingredients (alphabetical): Carnauba wax, colloidal silicon dioxide, corn starch, FD&C Yellow No. 6, hypromellose, iron oxide black, polydextrose, polyethylene glycol, propylene glycol, sodium cyclamate, sodium starch glycolate, stearic acid, titanium dioxide.